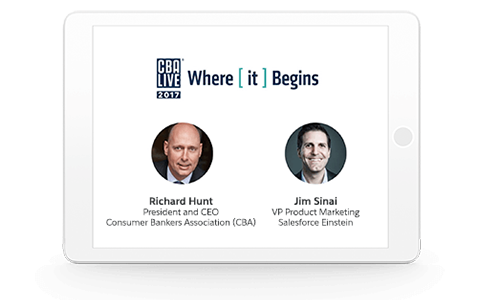 Watch Salesforce at CBA Live. Questions? Call us at 1-800-667-6390. Artificial Intelligence: Your Customers Are Using It, Shouldn’t You? Gain a competitive edge by implementing AI-driven strategies. Watch this CBA Live keynote to learn how pioneering banks are using artificial intelligence to drive customer loyalty. To watch the talk now, fill out the form on the right.